I'm looking for a reliable car that I can acquire cheaply with low miles. I don't need to worry about size as long as at least two seats are reasonable. 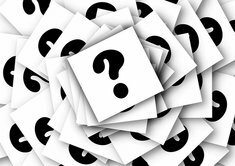 I'm willing to pay a little more for comfort and options, but I'm mainly focusing on reliability and maintenance. I have a short driving commute (5-10 minutes) every day, and I drive 50 to 75 miles on DC area highways every other weekend or so. I'm currently trying to decide between a Scion iQ and a Fiat 500. The former seems more reliable, but the latter seems more capable and pleasant to drive. First, you should definitely stay away from the Fiat if you value reliability. Or if you value having a car that will be worth more than its scrap value 5 years from now. I see you're considering really small cars; I'm not sure you actually gain anything cost-of-ownership wise to go from a 5-seat more mainstream compact/subcompact (Honda Civic, Toyota Corolla, Scion XD, Honda Fit, etc) down to the small sub-compacts that you mention. If you really want "small" for aesthetic or existential reasons, then OK; the iQ is the most reliable of the super-small cars. But if you just want reliability and low cost, the more mainstream compact cars are better designed and built, more reliable and more versatile to boot. You'll probably have to get one with more miles on it to fit in your budget, but again, because they're just better cars, they'll still be reliable. Since you drive so little, you're kind of an ideal candidate for a higher milage vehicle anyway; save the $$ up front and it will pay for all your repairs in the future. Likewise, I wouldn't worry about warranties either because on a reliable car, the repairs are cheap. 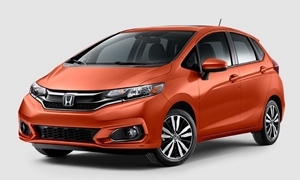 You might want to consider a Honda Fit. You probably won't be able to find them with that low miles, but I wouldn't really worry about that since they're so inherantly reliable. Read through the data on this site and you'll see that most people (my wife and I included), even with 100k+ miles on their Fits get through most years without any repairs. 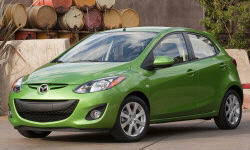 Size wise, midway between the Fit and the Scion iQ are the Mazda2 and the Toyota Yaris. They are both good, cheap sub-compact cars; not super plentiful on the market, but reliable. 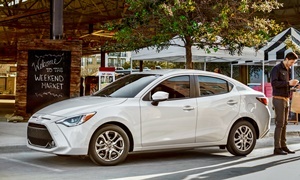 The Yaris has a little edge in reliability and the Mazda drives a little nicer. First of all, the Scion iQ and Fiat should be the absolute last on your list. I totally agree with mwcten on his recommendations, I'd get a used 2011 Honda Fit. The Yaris is a really cheap, reliable car that is also chintzy. 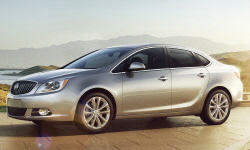 The most quietest, sub compact from 2012 in the $12,000 range is the Buick Verano. 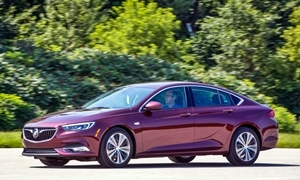 It offer s the best ride, Buick's Quiet Tuning, and decent fuel economy with it's 2.4l. We had the Verano 2.0T Premium and 6-7 rides were a breeze the car was so quiet and smooth riding.